Very Good. Very little sign of wear. Photos, index, 396 pp. Text clean & tight. Very Good. Very good + trade paperback shows some mild shelf and trace wear including light edge wear to wraps. 396 pages with black & whites. Solid copy of this installment in the Stackpole military series. Paperback. Very good or better. : World War Two. Ships directly from our store in Santa Barbara, California. Near Fine. 9780811731775. Stackpole Military History Series; 8.90 X 5.90 X 1 inches. As New. Glossy pictorial softcover. First printing of first edition. Book is in fine, As New, gift-giving condition, crisp and clean, with tight binding and sharp corners. Historic photos as well as Ace and crew info throughout. 8vo. 396 pp. including index. Stackpole Books, Mechanicsburg, PA, 2004. 1st Edition, 2nd Printing, Fine, Paperback, Size=6."x9. ", 396pgs(Index). Clean, bright & very tight. No ink names, tears, chips, foxing etc. 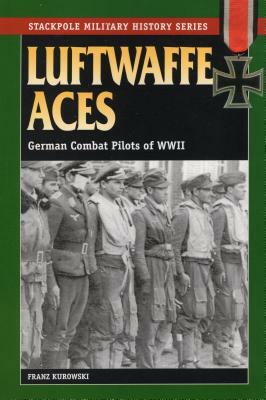 ISBN 9780811731775 [German Luftwaffe; Luftwaffe Pilots; World War II; Second World War; Aerial Operations; Fighter Pilots; Military History; Bomber Pilots] SELLING WORLDWIDE SINCE 1987. WE ALWAYS PACK WITH GREAT CARE!